2. You want to override a single host on contoso.com but your internal DNS server is not authoritative for that zone. 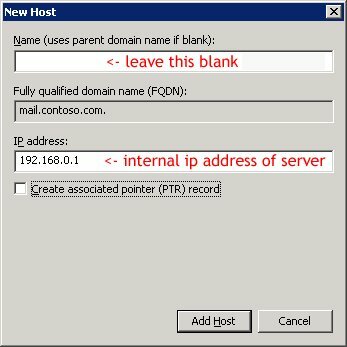 For example, mail.contoso.com points to the external IP address of your mail server but you want to override it so that it points to the internal IP address of your mail server for internal clients only. You could accomplish this by adding a record to the hosts file on every machine on your local network. But that would be very inefficient and hard to manage. You could also create a forward lookup zone for contoso.com on your internal DNS server, but then you would have to create host records for every host in that domain. The solution is to create a forward lookup zone called ‘mail.contoso.com’ on your internal DNS server. This is technically called a subdomain. However, you can create a blank host record within that subdomain and point it to whatever IP address you want. Thanks for that pointer Kent! Slight variation: Translated to your example situation, I’d like to internally resolve a couple of hosts like http://www.contoso.com, jobs.contoso.com etc. to resolve to a specific IP address (which is easy given your instructiona) but I would also like the FQDN contoso.com to resolve to the same IP address. Can that be achieved? Brilliant! Works perfect for sub-domains, but I see answering Marco’s question may not be possible with this approach.